Multipurpose wipes and burp pads help with everyday drips, drools and messes. Materials are soft, absorbent and machine washable. Multi-packs offer convenience and everyday value. Soft and absorbent pre-washed wipes are convenient for baby's drips, drools and messes. Single-layer organic cotton muslin. 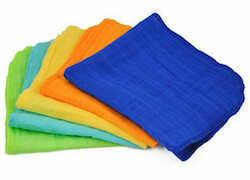 Includes 12" x 12" wipe each of aqua, pink, lime, orange and yellow.